We are a unique entity in this industry, actively committed to offering a premium quality range of Political Party Fabric Flag. We are engaged in offering high quality of election political party flag. Flag is the mechanical push-to-open, automatic gravity-closing flag barrier. It is commonly employed at swimming pool facilities, sport centres, fitness/ wellness centres, point of sale, safety exits, shopping malls and supermarkets. It is designed to ease passage of physically challenged people. 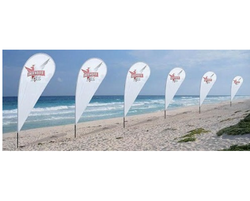 We are leading Manufacturer of different kind of 100% cotton flags. Feel free to contact if you want any kind of flags in bulk. To be responsible and encourage people to be responsible towards. 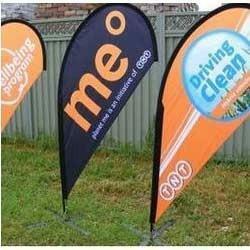 Due to its shape the feather Teardrop Flag also offers more space to print on when the sizes are equivalent.